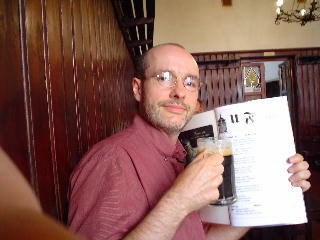 Owen enjoys the dark, spicy brew of U Fleku. 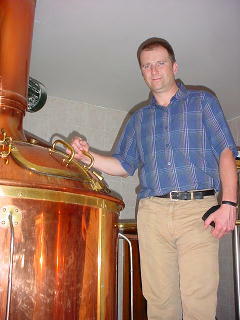 Owen Ogletree and Kerri Allen flew to Prague in June of 2004 to seek out the older, established brewpubs, bars, and restaurants that offer classic Czech beers and atmosphere. Get a good guidebook of the city that has detailed maps and a street index, and you will be able to pinpoint all the addresses given below. Click here for a Czech website that serves as a good resource for online mapping of locations in Prague. The personable pubs listed below have been around for awhile and offer wonderful atmospheres in which to enjoy your beer and Czech cuisine. Even in Prague, beer and food is relatively inexpensive compared to western Europe, but be sure to estimate your total bill before you give up the menu, as some places add on extra charges. Bread and shots of liqueurs that are offered to your table (and not refused by you) will be added to your bill. Do NOT deal with money changers who approach you on the street - they will not offer a favorable exchange rate and will likely give you older Czech currency that is no longer valid. Language is not a real issue in Prague as most places offer English menus; and the waitstaff tends to know a bit of English. There is almost no air conditioning in the Czech Republic, so be prepared for a little warmth if you visit in the summer. Pubs listed below are in the central areas of Prague's Stare Mesto (Old Town), Nove Mesto (New Town - south of Stare Mesto), and the Prague Castle/Mala Strana area (across the Charles Bridge). 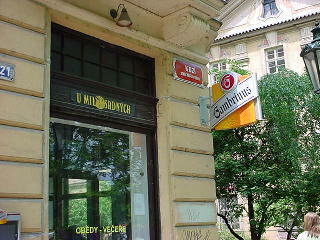 These Prague pubs are all very walkable, so there is no need for trains or taxis. Hi there Owen. My girlfriend and I stumbled across your excellent list of places to get hold of beer in Prague, and when we went there recently we decided to use it as the basis for our wanderings. Firstly, congratulations on an excellent sense of taste - by and large they were all great tips! I know you published it four years ago now, but in case you're interested there seems to have been a few changes - we could find no sign of U Glaubicu... assuming we were looking on the right road. Judging by the signs and the description, we figured it to be further along Letenska from U Tomase. It seems that this area has been undergoing a few changes, because U Tomase was also boarded up and (we think) being converted into residential space. And finally, though struggling through rain for a final beer before hitting the airport to come home, we couldn't find any sign of Radegast Pivnice either. There were some conspicuously new looking shops, so I suspect this one's another victim. 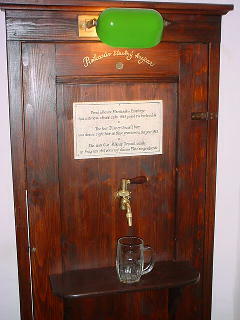 There are very few styles of beer available in the Czech Republic, with the most famous being Bohemian Pilseners of various strengths offered in half-liters. The title of this establishment means "Bethlehem Chapel" and is named for a shrine that is nearby. After you tour the shrine, you should be in the mood to stop by this pub for some house goulash or other hearty main dishes that come with delicious vegetables. The menu comes in an English version with color photos of all the food items. Kozel beers and Pilsner Urquell are offered. Czech President Havel once brought Bill Clinton to the Golden Tiger tavern for a beer, but the average beer tourist may find it hard to get a seat in this popular locals hangout. Have a beer while standing at the bar if all the seats are reserved for regulars. This is one of the world's greatest beer bars, so treat it and its regular patrons with respect. 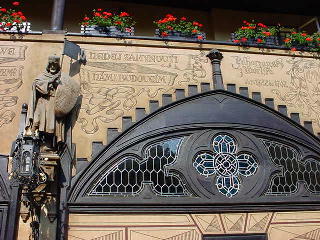 You'll see carvings of two small bears above the entrance of this classic Czech beer hall. Once inside you'll be sure to notice the beautiful small bar framed in copper pipes. This place was a brewery in the past, but now it is a friendly pub that serves the range of Budvar lagers along with Staropramen Amber (a malty, slightly fruity beer). This cavernous beer hall looks exactly like it came from 200 years ago. Named for a town mayor from the past, Vejvodu was saved from demolition in 1908 by a local historical society. 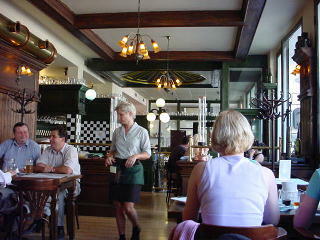 The pub features old brewery equipment and artifacts downstairs along with strolling musicians and filling meals. Gambrinus and Pilsner Urquell beers are available. 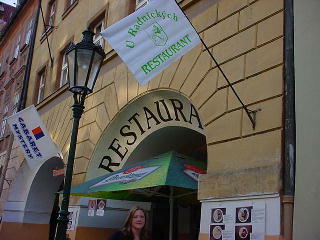 This is a very pleasant pub and restaurant located near one of Prague's outdoor markets. The large food menu is in English and very easy to figure out, and the Kozel Dark and Bernard-Kvasnicovy Lezak Wheat beers are delicious. Outdoor seating is available out front. 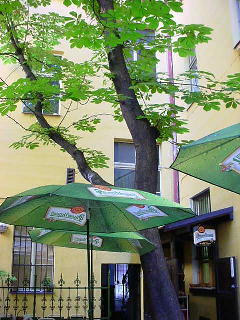 Pinkasu is an attractive pub near the famous Wenceslas Square that features Pilsner Urquell and Kozel beers. There is a pleasant beer garden in the back that is built on multiple levels, and inside the pub you can visit the spot where the first Pilsner Urquell was tapped in Prague after a ban on outside beer was lifted many years ago. First Pilsner Urquell tap in Prague! This is a no-frills beer hall that is very long and narrow with many wooden paneled booths lining the walls. The decor is ordinary and a bit plain, but the atmosphere is authentic and the service is speedy. Locals and the occasional tourist frequent this establishment for its selection of inexpensive food and Radegast and Gambrinus beers that are served all day. 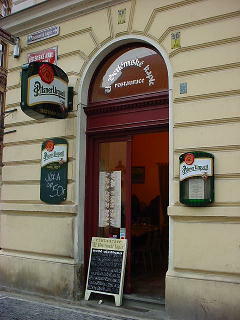 Across the street from the Spanish Synagogue, Pilsner Urquell has set up shop with a new branch of their Pilsner Urquell original restaurants. Kolkovna is a beautiful beer and food hall with a fantastic menu. Prices are a bit higher here than at older, privately owned pubs, but the quality of the food and beer is outstanding. 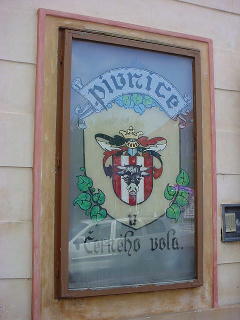 The name of this pub and street translates to "sisters of mercy." It is a classic Czech neighborhood pub with a gorgeous dark wood interior. The pub serves authentic, substantial Czech cuisine; and the food menu is divided into different meat selections: beef, chicken or pork. If you are really hungry, try the massive potato pancake filled with a breast of chicken. Gambrinus, Pilsner Urquell, and Krusovice dark are enjoyed on tap. Records from the fourteenth century claim that around the corner used to be thirteen brewpubs! Those were the days! This modern bar is not typical of the classic Czech beer taverns, but is listed here because it offers a wide variety of beers not usually found in Prague. 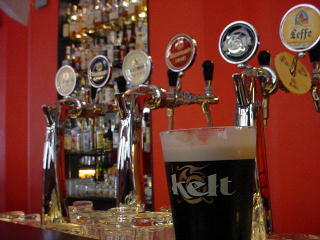 Kelt is a Czech beer that tries to be a Guinness clone of sorts - it is nitrogen pushed and has a thick mouthfeel and flavors of burnt chocolate. Husa's beer menu includes Kelt, Leffe, Hoegaarden, and the range of Staropramen beers on draft. There is also a good selection of bottled imports. The cheery murals on the outside of this pub invite the beer traveler in for a welcome half liter of Pilsner Urquell or Kozel Dark. The place is warm and friendly with many interior rooms and a varied menu available for lunch and dinner. 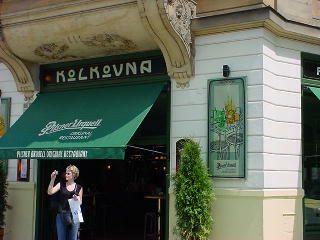 No trip to Prague would be complete for the beer lover without a stop in what is probably the world's oldest brewpub. 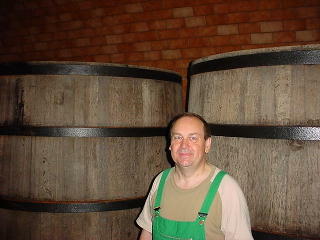 U Fleku dates from 1499 and produces a dark, spicy, strong beer that is utterly superb. The beer and food here are more expensive than most places in Prague (due to the touristy nature of the place), but everything is well worth the price. Be sure to sample the smelly onion and garlic cheese spread over bread with your U Fleku brew. The courtyards are filled with brewing murals and slogans. The brewhouse is upstairs and lagering cellars downstairs. 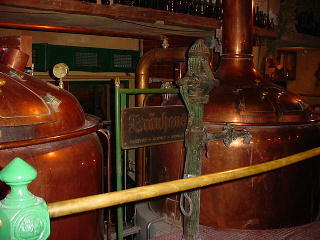 The old wooden fermenters are impressive, and the whole place drips with charm and history. This delightful pub and beer garden has interesting antique photos all over the walls of the inside dining rooms and boasts a big menu with English translations. There are two large chestnut trees in the popular inner courtyard that make for a serene dining and drinking experience. Radegast, Pilsner Urquell, and Kozel are on draft here. Next door to McDonald's you'll find a very delightful beer hall and restaurant. The Branicky Sklipek has a pub to the right and a restaurant and smaller pub to the left of the main entrance. 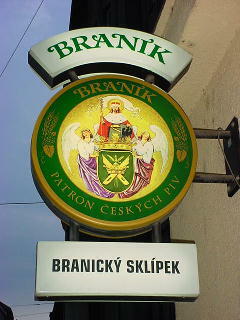 Branik's pale and dark lagers are featured here - the light Branik is very pleasant and somewhat Kolsch-like in flavor. The pub is located very near the New Town Hall and the New Town Brewery discussed next. This brewpub opened in the late twentieth century (much later than U Fleku) and is located down a hallway through a shopping area. The place is fun and has multiple rooms (some with music) including a glass roofed upstairs terrace. The brewing equipment is in the center of the entrance, and the pub produces tasty house pale and dark lagers. The food is satisfying and includes many welcome vegetarian entrees (the potato noodles are delicious). 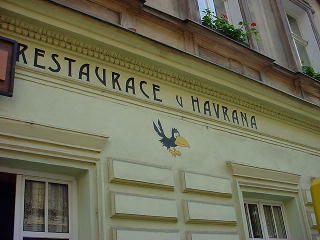 If you are in Prague and can't sleep, why not head over to U Havrana for a beer at 4 am? 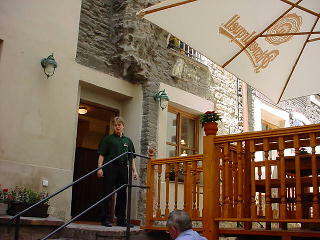 This tavern is open 24 hours most days and features the range of Kozel beers. The place is pleasant, tidy, and comfortable. This brewpub has a bright, open, cheery personality about it. The house beers are all light in flavor, but quite unique and refreshing. The beer list includes brews with wheat, coffee, banana, and sour cherries. A Bock, Pilsner, and dark lager were also available when we visited. The tiny brewery and fermentation rooms are off to the right of the main restaurant, and shallow, open fermenters are visible through the windows of the restaurant. The food menu is quite extensive. 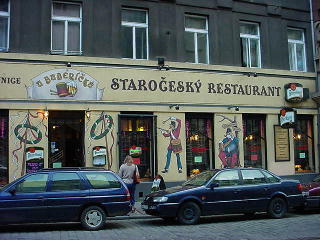 Czech writer Jaroslav Hasek used to frequent this pub and have long drinking sessions with Bohemian soldiers. 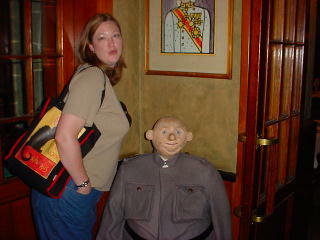 It is said this is how he got the idea for his fictional character of the good soldier Svejk (Schweik). 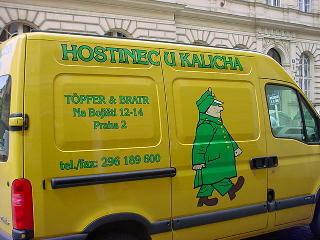 Svejk's likeness is featured on the tavern's van, as a wax figure in the front entrance, and all over the odds and ends in the gift shop. There is a large, square dining room in Kalicha where tourists and locals consume hearty Czech menu items and Pilsner Urquell and Kozel beers. This large beer hall with upstairs and downstairs areas is located near the Kampa park green-space just south of where the Charles Bridge brings you over from Old Town to the banks of the Mala Strana (Little Quarter). There is a big, diverse menu here along with malt beverages that include Pilsner Urquell, Gambrinus, Kozel, Murphy's, and Guinness. This pub is named after a strong dark beer that was once brewed in this location by Augustinian monks. Sadly, this beer is gone, but you can still enjoy Ferdinand dark 11 here. Ferdinand dark is an interesting beer with sweet notes of toffee. 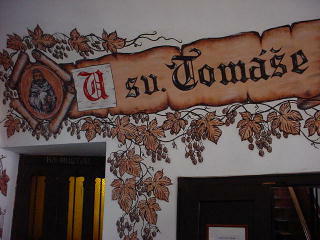 Tomase is popular with German tourists and has attractive cavernous cellars. Beer prices are a bit higher here than the norm in the rest of Prague. This attractive beer hall has a cellar that is almost 700 years old. The food menu is loaded with mouth watering grilled meats, and the beer taps dispense Pilsner Urquell, Kozel Dark, and Erdinger Weiss. 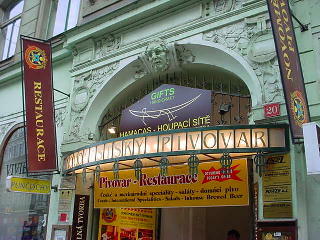 The name means "Tom Cat" in Czech, and when you walk through the old wooden front doors you'll find a narrow tavern with three sections end to end. 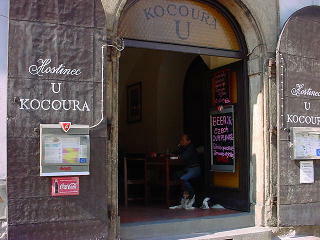 Kocoura is mostly a locals pub that offers Pilsner Urquell and light snacks. Despite the fact that the area surrounding this pub has recently become more polished, remodeled and touristy, "The Black Ox" clings to its old world personality and atmosphere. It has beautiful windows and woodwork. Kozel and Pilsner Urquell beers are offered, and the food selection is limited but very satisfying. 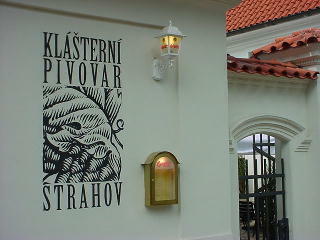 This lovely, privately owned brewpub sits on the grounds of the Strahovsky Klaster (abbey). This location had been a brewery in the not-to-recent past, but in 2001 the new brewery restaurant opened its doors. Their Pilsner lager and other beers are flavorful, unfiltered, and unpasteurized. The amber lager is clear and slightly dry and hoppy, and the dark is well hopped and has a slightly roasted, caramely flavor. The small 1,200 hl brewery is visible in the main bar/dining area, and the food is some of the very best we enjoyed in the Czech Republic. Be sure to try the old Bohemian recipes that are cooked with beer. The entire establishment is very attractive with several indoor dining rooms and outdoor beer garden. "If you have too much fun visiting all these bars you may end up needing mobility scooters! A taxi might be more practical, but the scooter might be pretty fun."